More so than any other night of the year, Halloween concerts offer the most tricks and treats. Among this year’s thrills, 13th Floor Elevators founding frontman Roky Erickson will perform his 1981 cult classic The Evil One LP in its entirety at San Francisco’s The Independent. Billed as “A Halloween Masquerade Ball,” local psych favorites The Fresh & Onlys are set to open. This will be the third and final of a trio of shows Roky has scheduled for Halloween; the first in his hometown Austin on October 28th at The Charles Johnson House, the second at North Fork, California’s Vertigo Festival in Bandit Town on October 30th. Following his trip to California this past March for Burgerama IV and the 13th Floor Elevators reunion at Levitation in May – the group’s sole performance since 1967 – Roky’s Halloween run are his only dates of 2015. All three concerts of the October mini-tour will feature Roky with The Hounds of Baskerville performing The Evil One. The Austin show on Wednesday, October 28 is the second annual Roky Erickson’s Celebration of a Family Curse, a benefit for the SIMS Foundation (a low-cost counseling service for members of the Austin music community). Pumpkin patches, apple bobbing and a hunted house are all planned. The evening starts at 6pm with “Trick or Treat” for both kids and adults. The Gorlons​ will kick-off the live music at 7pm, with sets by The Hounds of Baskerville​, Scott H. Biram​ and headliner Roky Erickson to follow​. A) Erickson and the 13th Floor Elevators were targeted by authorities for their outspoken embrace of drugs in the mid ’60s. B) Erickson was arrested for possession of a joint and pleaded insanity to avoid prison. C) Roky was sent to Rusk State Hospital for the criminally insane and while there received electroconvulsive therapy and Thorazine treatment, damaging him for years to come. D) While away his cult status grew, in large part due to “You’re Gonna Miss Me” being featured on Lenny Kaye’s seminal Nuggets comp in 1972. E) After being released Roky sought a harder rock sound with a new band, the Aliens. F) While struggling to rehabilitate and cope with addiction, over two years Roky recorded his first solo album with the Aliens, The Evil One. Produced by former Creedence Clearwater Revival bassist Stu Cook, and taking the form of the I Think of Demons LP in the UK, its idiosyncratic lyrics were hell bent on ghoulishness, as illustrated by the song titles of some of its stand-out tracks: “Two Headed Dog,” “I Think of Demons,” “Don’t Shake Me Lucifer,” “If You Have Ghosts,” “I Walked with a Zombie,” “Night of the Vampire.” In short, an album virtually made to order to be performed on Halloween. The hottest ticket this Halloween is undoubtedly the latest incarnation of The Grateful Dead. Following the Dead’s 50th anniversary “Fare Thee Well” concerts this summer grossing $52.2 million in five shows, three of the “core four” living members of the band (Bob Weir, Mickey Hart, and Bill Kreutzmann) are teaming with John Mayer under the name Dead & Company for a pair of shows October 31st and November 1st at Madison Square Garden. It will be preceded by a tour opening night gig in Albany on October 29th, essentially a warm-up for the Garden Halloween shows. Numerous other Grateful Dead related shows are happenin’ around the country this Halloween as well, particularly in New York. Among them: Deadgrass plays Pinks, The Cutting Room presents “Reflections: A Jerry Garcia Tribute” and Sunshine Garcia Band is playing Halloween afternoon and two sets November 1st (the first an unplugged American Beauty sing-along) at American Beauty Bar (formerly Slake). The sets are scheduled around Dead & Co.’s shows at the Garden so the party doesn’t have to stop when John Mayer does…. Phil Lesh, the one member of the Grateful Dead’s “core four” not at the Garden, has six shows between October 30th and November 7th at his east coast home away from home: Port Chester, New York’s Capitol Theatre. Phil and Friends’ Halloween concerts takes place just 30 miles north of Dead & Company’s Madison Square Garden party. For his upcoming run Phil will be joined by Stanley Jordan, John Kadlecik, Jason Crosby and Tony Leone and Nugs.tv has announced webcasts of all three Halloween shows in both standard and high definition. Voodoo Music + Arts Experience returns to New Orleans October 30th through November 1st and Yahoo! Live has announced free live webcasts from all three days. Halloween night will be headlined by Ozzy Osbourne’s super group featuring Geezer Butler, Tom Morello and Slash. Also on Halloween: Jane’s Addiction, Public Image ltd, Santigold, Lettuce, The Growlers, Django Django, Giorgio Moroder, Peaches, Babes In Toyland and more. Playing the fest the days before or after Halloween: Modest Mouse, Zac Brown Band, Florence + The Machine, Jack U, Deadmau5, Girl Talk, Chance the Rapper, Metric, Slightly Stoopid and many more. 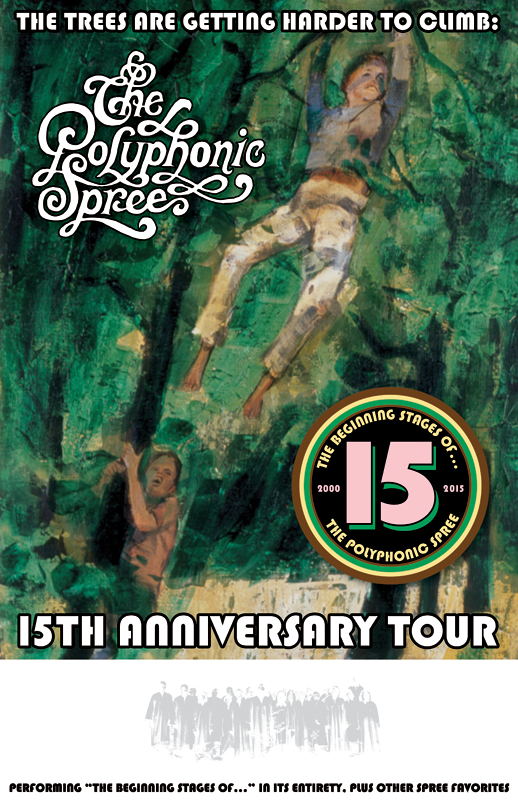 Polyphonic Spree 15th anniversary tour runs from October 17th through November 21st, including a Halloween show in Somerville, MA. As they are on every stop of the tour, Spree will perform their debut album The Beginning Stages of… in its entirety for the first set on Halloween, followed by a second set of other treats. Telegraph Canyon and Party Bois will open, and there will be a Halloween costume contest. Nearby in Boston, Grace Potter has a two-night Halloween run at The Orpheum, October 30th and 31st. These dates, both with Charles Bradley, will end Grace’s Fall tour. Also in Boston Gary Clark Jr. plays House of Blues. Chappo will play a Halloween Party at The Flaming Lips’ freak/art space The Womb. Lips associate Zachary Cox will unveil his MDMA therapy paintings, and Wicked Hippie (Katy Weaver and Tanner White) will host a pop-up shop beforehand. All attendees are requested (required?) to come as a “naked green witch, a red blob or a silver space alien.” Doors open at 10pm, and it’s free! Spaceface will play their final show of the year this Halloween on a co-bill with Fever The Ghost at Memphis’ The Hi-Tone. They’ll host a costume contest with the winner receiving a personalized song written by Spaceface’s Matt Strong and performed by the band. There will also be a raffle with assorted goodies, plus bouncy castles, balloon artists, interactive projection games, a freaky tadpole spawn installation and more. Sweetest treat of all: it’s only five bucks if you bring two canned goods to donate! New Spaceface T-shirts designed by Andrew Pawley (who also created the poster art shown below) will be available at the Halloween show as well. This will be a super limited run of shirts; be there if you want one! All three nights of Umphrey’s McGee Halloween run in Milwaukee will be webcast by TourGigs with looping replays for about 24 hours after each show. Expect some monster mash-ups, as is the Umphrey’s tradition. 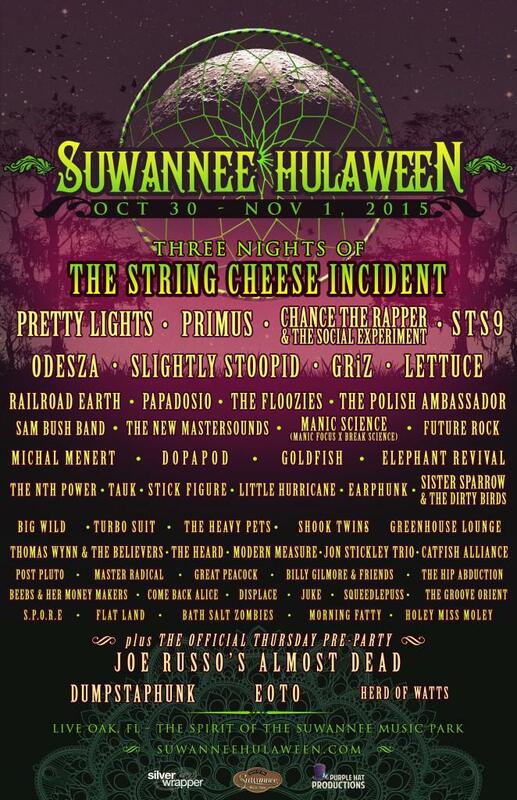 The String Cheese Incident host their annual Suwannee Hulaween in Live Oak, FL. String Cheese play three nights, and are the main attraction on Halloween. Other nights feature Primus, Pretty Lights, Chance The Rapper & The Social Experiment, STS9, Slightly Stoopid, Lettuce and Railroad Earth. All three nights will be broadcast on SiriusXM’s Jam On. Widespread Panic also have webcasts this Halloween. Video of their October 30th and 31st performances in Asheville will be available at LiveWidespreadPanic in standard and high-definition formats. Finally, Nugs.TV will present webcasts of Disco Biscuits October 29th performance in Boston and Halloween gig in Syracuse. Next ‘Portlandia’ Season 6 Premieres Jan. 21, features Flaming Lips, Danzig, Louis C.K.